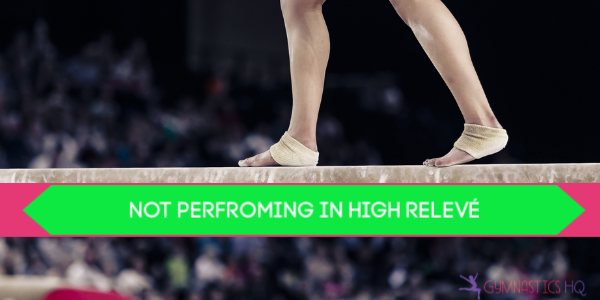 You spend a ton of time working on improving your gymnastics skills and perfecting your routine with the goal of getting a good score at your meet. Then you go to your meet, judges score your routine, and it can sometimes seem like they take off for everything. They take deductions for skills that aren’t done perfectly and any errors you make while performing. They also take some overall deductions in order to rank routines, to separate the amazing routines from the ones that aren’t as good. So while every gymnastics routine is different, and there are alot of different deductions that are possible, here is a list of deductions that you are probably getting on your gymnastics routine, along with how to avoid them. The first deduction you are probably getting is for artistry. There is a deduction for artistry on both Floor and Beam. Judges can take up to .3 off your routine in order to distinguish between the gymnasts that really perform their routines, and those that don’t. One of the things they look at is your “quality of expression”. The viral video of Katelyn Ohashi’s floor routine is a great example of a routine where she showed great quality of expression. Watch the routine and notice how her expression changes during the playful parts of her routine, and then the more serious parts of the routine. Think about the tone of your floor routine choreography and the music. Is your expression matching the tone? Does your expression change during the different parts of your routine? Are you keeping the judges engaged and excited about your routine based on your expression? How can you change your expression throughout your routine to make it more engaging? To avoid this deduction, practice changing your expression at home in front of a mirror while you go through the dance parts of your routine. The next deduction that most gymnasts receive is for insufficient height. 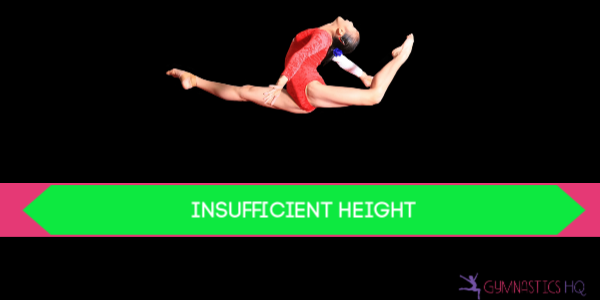 The deduction for insufficient height changes depending on your level and whether you are doing a leap or jump, or an acro skill. Keep in mind that height only matters on some acro skills–flight elements, saltos, aerials and dismounts. But for every leap or jump you do in your routine, judges are looking to make sure you get high enough off the floor or beam. And if you don’t, they take a deduction. For example, if you do a round-off back handspring back tuck in your floor routine, judges will be looking at the height of your salto to make sure you got high enough off the floor. If you do a straddle jump, they are watching to see how far you come off the floor. So how can you avoid this deduction? Work on improving your leg strength so that you can jump and leap high off the ground, and so that your tumbling is powerful and explosive. You can check out this article on improving your jumps for more tips and exercises you can do. 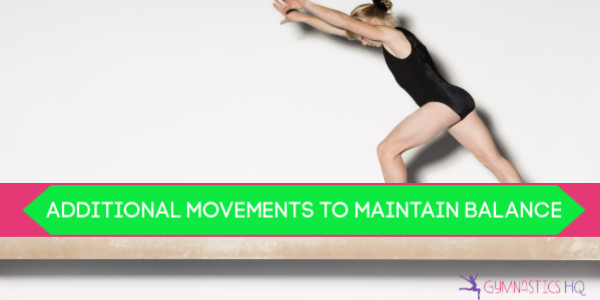 Another deduction that most gymnasts receive is for additional movements to maintain your balance on beam. You need to stay completely tight with no wobbles to avoid this deduction! We know this is very hard to do. But judges can take up to .3 off your score every time you wobble. This means that for small balance checks they will take .05 or .1, for medium wobbles they will take .2 and then for large wobbles, or if you grab the beam to not fall off they will take .3. You can avoid this deduction by working hard to improve your tight body position. Practice walking up and down a low beam or line at home, and try to stay completely straight without any bobbling! One of the main things judges are looking for on Vault is for it to be really powerful and fast. Judges want to see you hit the springboard, explode off of it, touch the vault table, and then explode off of the vault table in order to repel yourself high into the air. For every vault judges see, they are asking is it dynamic enough? Did the gymnast have explosive power? And if it wasn’t extremely powerful, they are taking a deduction. Depending on your level and what vault you are performing, you could also be getting a deduction for too long in support. This means you spent too long with your hands on the vault table. The more powerful you are though, the less time you will spend in support on the vault table. Think about a pencil. It’s straight and doesn’t bend. If you throw a pencil down at an angle it will immediately bounce off the ground. Now think about a cooked spaghetti noodle. It can’t stay straight, it does nothing but bend. If you throw a cooked spaghetti noodle at the ground, it doesn’t bounce, it just lays on the ground. When you vault, you want your body to be like the pencil. When you hit the springboard, you want to bounce off of it, on to the table, where you bounce off and then land on the ground. So in order to have a powerful vault and avoid this deduction, make sure you have an extremely tight body position throughout your vault. Also work on trying to strengthen your legs so you can run faster and punch off the board harder. Work on strengthening your arm muscles so you can push off the vault table harder. 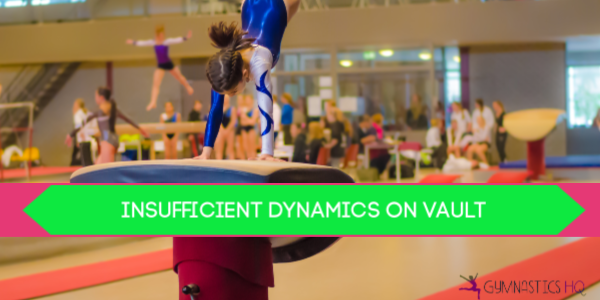 All of these things will make your vault more dynamic! Another deduction that most gymnasts are probably getting is insufficient amplitude of skills on bars. In gymnastics, amplitude means height. For every cast and swing you do, judges are looking to make sure it got high enough. Depending on your level, you will need to cast to a certain angle in order to get credit for it. For example, at Xcel Bronze your hips just have to get off the bar to get credit for a cast. At Xcel Gold, you need to cast to horizontal to get credit for it. In the optional levels, you need to cast to vertical in most situations in order to avoid a deduction. At higher levels you will also need to get to a certain angle to avoid deductions for circling skills and pirouettes. In order to avoid this deduction, make sure you are casting and swinging as high as you can throughout your routine. 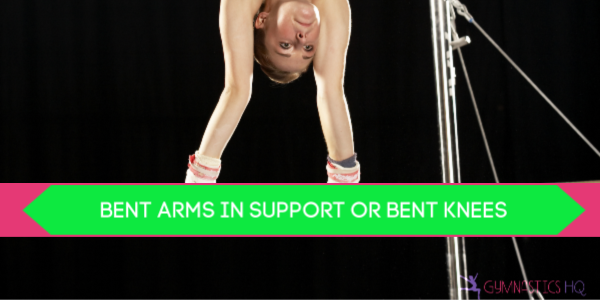 One more common deduction gymnasts receive is bent arms in support or bent knees. This is applicable on all events. Judges can take up to .3 (more on Vault) off a gymnast’s score each time it happens. Many gymnasts get this deduction because it’s hard to keep both your arms and legs completely straight throughout your routine. But in order to avoid this deduction, make sure you are strong enough to keep your arms completely straight. Then watch video of your routines and notice every time your arms or legs bend. Make it a point during practice to try to keep them straight. The deduction for not pointing your feet is small, but it can add up throughout your routines. Judges take .05 off your score each time you perform a skill without pointed feet. Depending on your level, there could also be a deduction for foot form throughout your routine, which means if you really don’t point your feet you could get even more taken off your score. Solution to avoid this deduction? Point your feet!! Practice pointing your feet when you are sitting watching TV, or when you are doing basic skills at home. Make pointing your feet a habit so you don’t have to think about it while you are performing. This is a deduction you probably haven’t thought about. When you vault, are you bending some in the air as you come off the springboard on your way to the vault table? 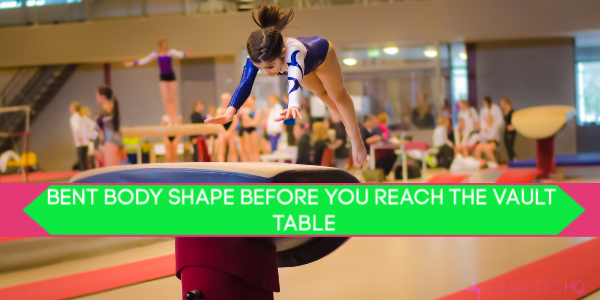 The amount of deduction varies depending on your gymnastics level, but you don’t want to be bending your hips or leaning too far forwards as you hit the springboard and move towards the vault table. You want to be hitting the springboard with a nice tight body position and then (depending on your vault) have a nice tight hollow body position in the air as you approach the vault table. This is another deduction you might not have thought about, but is probably a reason you are getting tenths deducted from your score–rhythm. You can get rhythm deductions on beam for not having smooth connections and for concentration pauses. 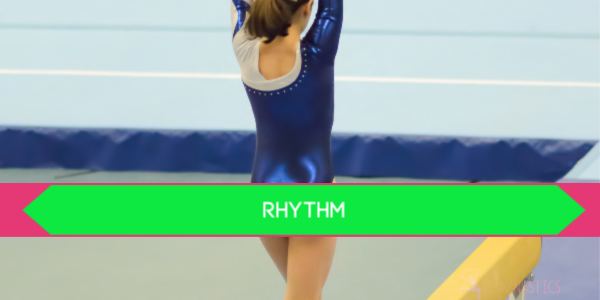 On floor you can earn rhythm deductions for not having smoothly connected skills and for not ending with the music. And on bars judges can take rhythm deductions if you stop or have any extra swings. How can you avoid this deduction? Any time two skills are supposed to be connected, make sure that as soon as you finish one skill you immediately start the next. Make sure you perform the dance in your routine without pausing. Try not to pause your routine to concentrate before you do a skill. Basically, you want to keep your routines flowing, and to not break your rhythm at any point! The last deduction that you are probably getting is for not performing in high relevé. Depending on your level, there can be deductions for not performing turns in high relevé along with a general deduction judges can take for your foot work for the entire routine. You want to make sure that whenever possible to be taking steps in relevé in both your floor and beam routines. And you want to make sure during your turns you are really pressing the ball of your foot into the ground so that your heel can rise as high as possible. Adding more relevé to your routine is an easy place to improve! If you go through each of your routines and work hard to improve in each of these 10 areas, you will definitely see improvement in your scores. I am doing level 5 right now so how could I demonstrate artistry, since everyone does the same rountines. Great question Anna! Artistry is more than just how you move. It involves the expression on your face. So even for Level 5 you can try changing up your expression and also hold your head high. Hope that helps!